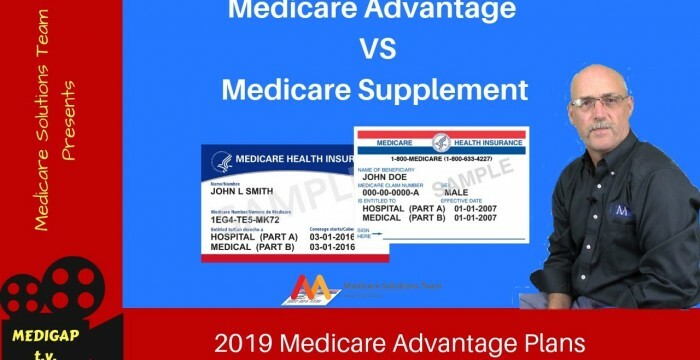 As discussed in this video Medicare Advantage plans have many differences to a Medicare Supplement (Medigap) Plan. The biggest is the network, in a Medicare Advantage Plan you will be required to stay in Network for all your Medicare procedures. This fact alone can cause some major problems if you need a specialist or care facility out of Network. The second biggest issue is that the plan can change at any time and you are locked in for a year. Your best option in most circumstances is to go with a Medicare Supplement during your original open enrollment and then making a change next year if you feel it is not a good fit or that the premiums are much to high. This entry was posted in medicare supplement and tagged #medigap tv, medicare, medicare advantage, medicare advantage cons, medicare advantage pros, Medicare Advantage vs Medicare Supplement, Medicare Supplement, medicare supplement cons, medicare supplement pros, medicare supplement vs medicare advantage, Medigap, medigap vs medicare advantage, plan d. Bookmark the permalink. ← Can I Keep Plan F | Is Plan F Going Away? Choosing between a Medicare Advantage Plan or a Medicare Supplement Plan is a big decision, comment below with any questions or call 844-528-8688. There is never a fee for our services. After day 90 what is the cost of inpatient care? With which plan D Williams? Just Medicare, Medicare Advantage or Medicare Supplement Plan. It is very rare for someone to be in a hospital for 90 consecutive days without being moved into a different type of care facility. I’m concerned about costs after 90 days hospitalization for Medicare Advantage. What are those costs? I need to know to make my own decisions; I would prefer to die inside of 90 days rather than exhaust the inheritance I’ve worked to provide my grandchildren. I am a retired nurse-scientist who would agree that it is “statistically” uncommon for a senior citizen to be hospitalized over 90 days. But it is not rare, and hospital stays have a relationship to payment versus patient stabilization—as long as the patient is not readmitted to the original hospital, there is no financial penalty for reimbursement under the Medicare insurance program that already does not cover the cost of inpatient care. This will depend on the plan but this is the way one from the largest providers is set, several plans have the same terminology. Your plan covers an unlimited number of days for an inpatient stay. Days 91 and beyond: $670 coinsurance per each “lifetime reserve day” after day 90 for each benefit period (up to 60 days over your lifetime). with the $6700 limit on a medadv plan, does that include the 20% of cancer drugs…or is that an unlimited amount? It would be 20% up to your maximum out of pocket. Do the Out of Pocket costs paid for the Mcare Advantage Prescription Drugs (Tier 1 – 5) contribute toward the maximum annual Out of Pocket $ amount ($6700 in your example)? Thanks. Marianne, no the prescriptions do not count towards the out of pocket maximums.